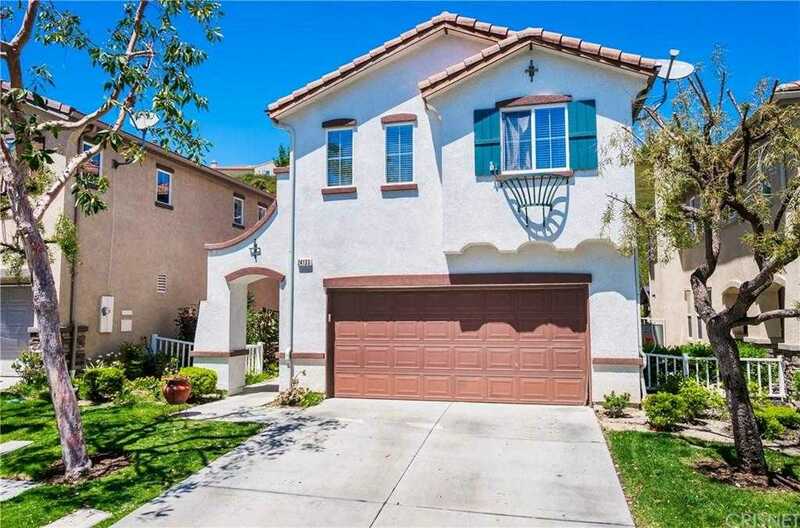 Listing courtesy of Michael Rescigno (CalBRE #01001610), Berkshire Hathaway HomeService. This 4 bedroom home is located in Tesoro Del Valle – one of Valencia’s most sought after neighborhoods. This home features a wonderful floor plan with an attached two car garage. When you enter through the front door, you’ll be greeted by a large living room with a gas fireplace and mantle/surround. The kitchen has granite counters, backsplash, Center Island, and tile floors, and opens to the adjacent Family room w/ a ceiling fan. The seller states that they paid a lot premium for their large private yard. . . Br’s 2 & 3 have ceiling fans and mirrored closets. Br #4 has mirrored closets but does not have a door. The master bedroom includes a walk-in closet, ceiling fan, and a bath that features a dual vanity. Stamped concrete patio in rear yard. Upstairs Laundry room w/ tile floors. Welcome Home to your new home 24133 Tango Drive. Building size: 1941 sq ft.